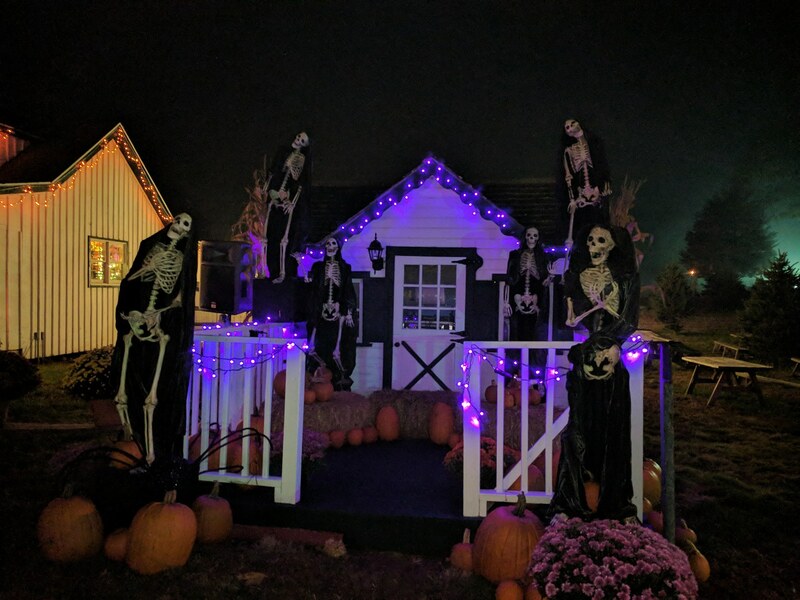 Team Hallowoosh reviewed this attraction on October 6, 2017. 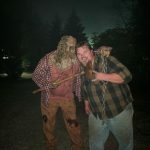 We are still kicking ourselves in the head for missing out on this hidden gem of a haunted attraction for this long! 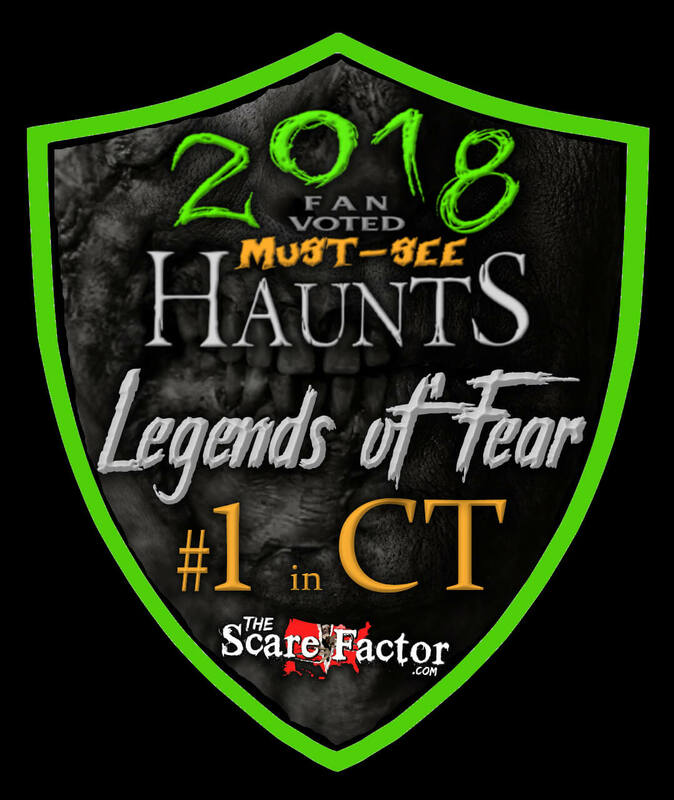 Now celebrating their twenty first season in 2017 and with brand new updates that will blow your mind, Legends of Fear at Fairview Tree Farm in Shelton Connecticut is one of the greatest halloween destinations we have ever seen. 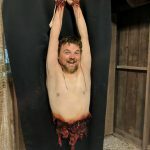 It isn’t very often that we come across a great haunt that likes to mix a bit of actual Halloween in with their horror but when we do it always just feels right. Not sure who was trying to make it a rule that everything a haunt is suppose to do is to scare the living heck out of you. 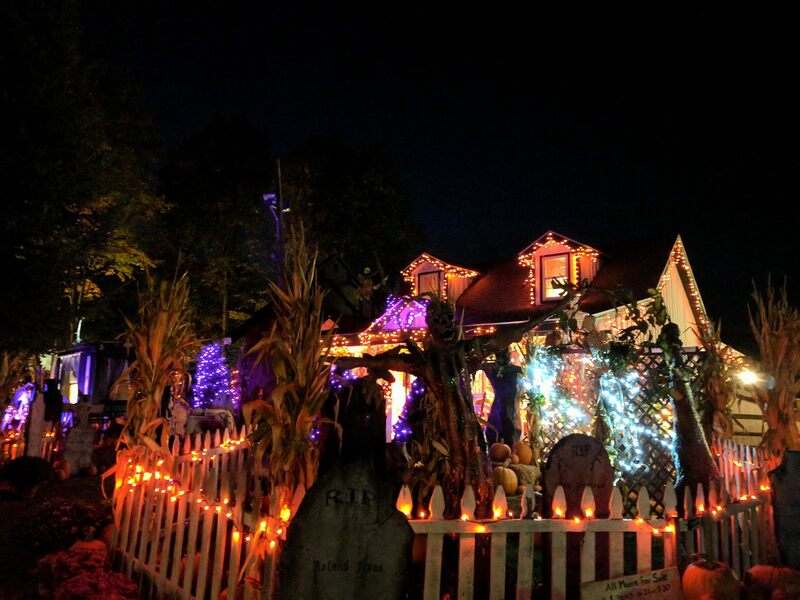 It’s been hard enough to find places that can do that in general, but to find a place that can make you fear for you life and then calm you down with some nice family fun and a cup of hot cider? That is something special. 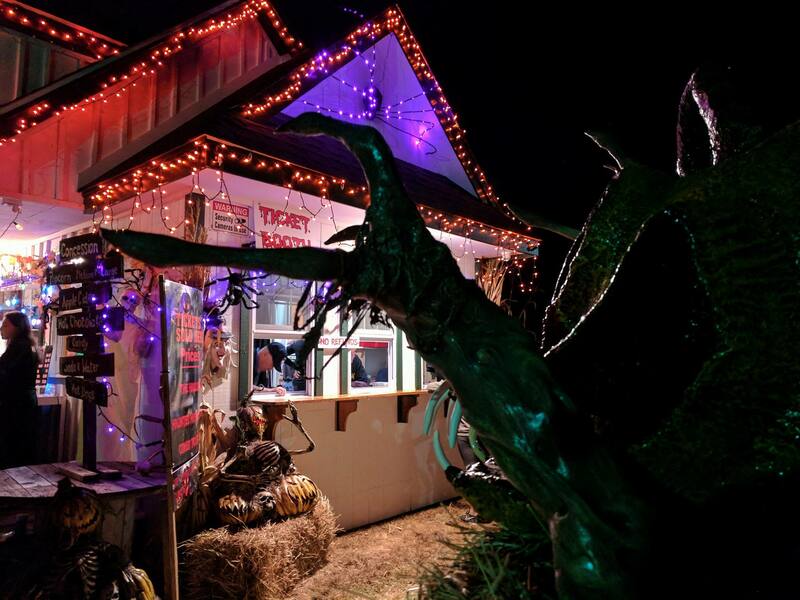 Legends of Fear is owned and operated by the amazing Wells family on their tree farm. 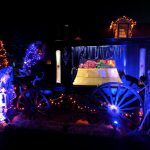 Their hayride now takes you on a ride you do NOT want to miss going through all kinds of things we have never seen before. Almost a mile long and lasted us a good thirty minutes, right there alone is enough for a good evening but the party’s just beginning. The haunted trail walk called “The Hallow” is a bit of a hike but we loved every step of the way. 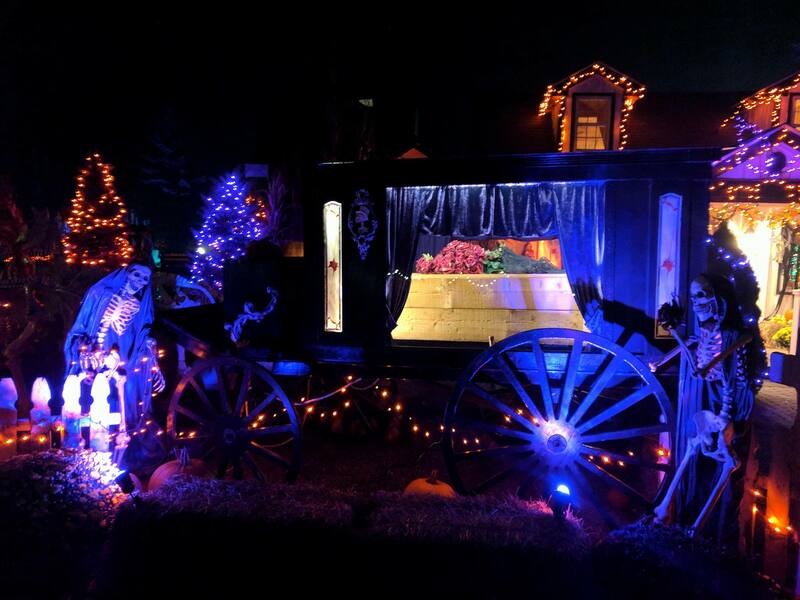 Especially with the all new Hemlock Manor Mortuary making it’s debut this year. 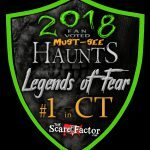 Some of our other haunt friends were asking me afterwards what I thought about Legends of Fear. The second I mentioned that they added a multiple room house in the middle of the trail they could not pull out their planners quick enough. 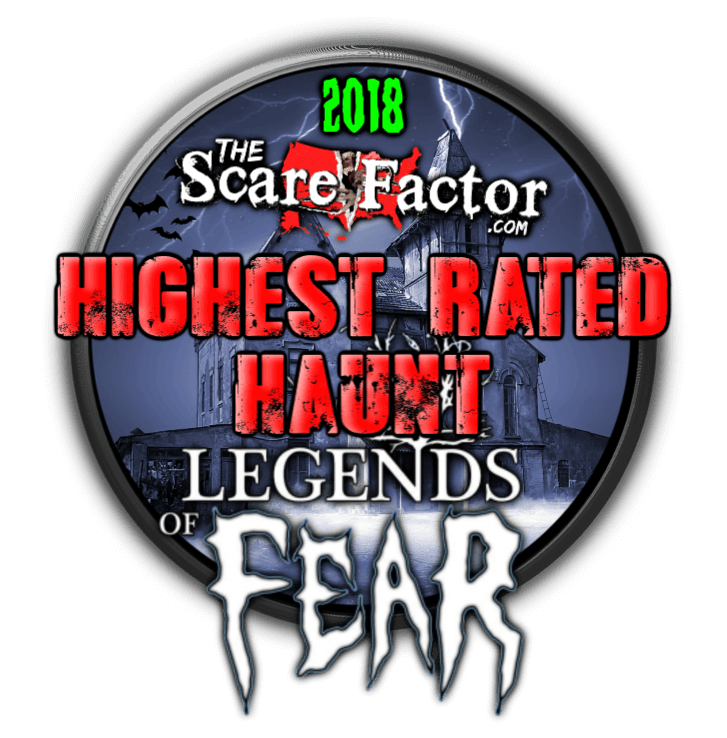 If that told me anything it’s that Legends of Fear was already really good and now people in the business want to find out what else they can do. In 2016 we were on our way back up from a weekend in Pennsylvania and we decided to stop at Fairview Tree Farm just to see how the place feels. This was in the middle of the day with the sun shining bright. We were treated to a short version of their hayride with no actors and I thought to myself that this place is actually a lot of fun. It was then we introduced ourselves to owner Mr. Brad Wells and he politely let us walk the trail. The sites we saw on the trail without spooky lighting or actors or music or anything were creepy enough. 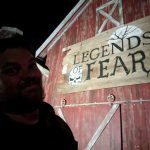 I felt terrible about not being able to make it in 2016 but on that day I knew Legends of Fear was the first haunt on my list for 2017. We made it out alive despite the multiple times we felt for sure we would not. 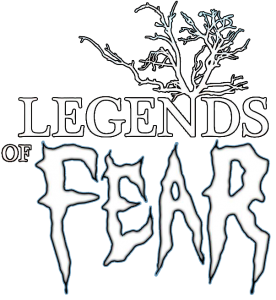 Will you be the next ones to face your fears and challenge the melon heads of Legend of Fear? We dare you to read on. Parking and walking up to the ticket booth we noticed a really good presence of walk around actors. We didn’t go too far for some time but we’re pretty sure we saw all of the queue line and free roam actors come and go at least three times. 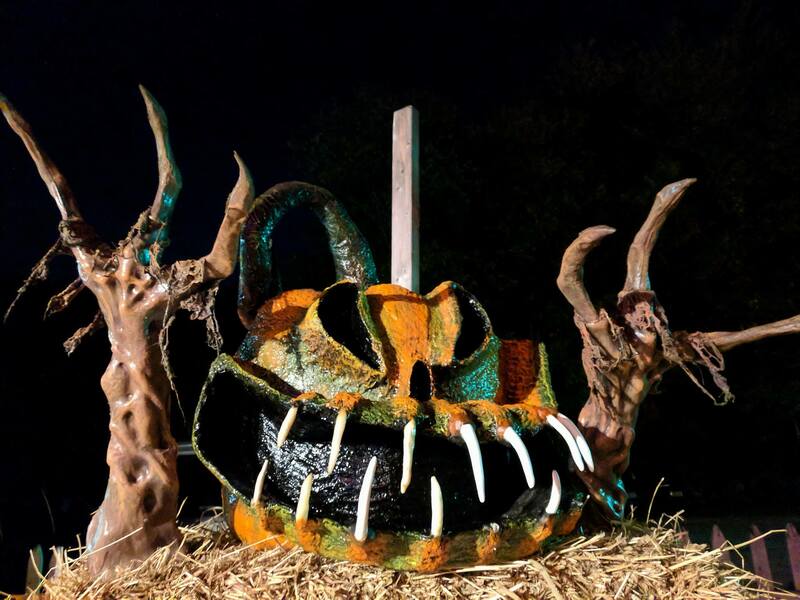 They had bloodied up hillbillies, a crazy doctor with a strange creature in a box, killer scarecrows, killer pumpkin patch monsters, and my personal favorite a sick and twisted tooth fairy that gave me a penny and tried to pry one of my teeth out! And we hadn’t even made it to the ticket booth yet! 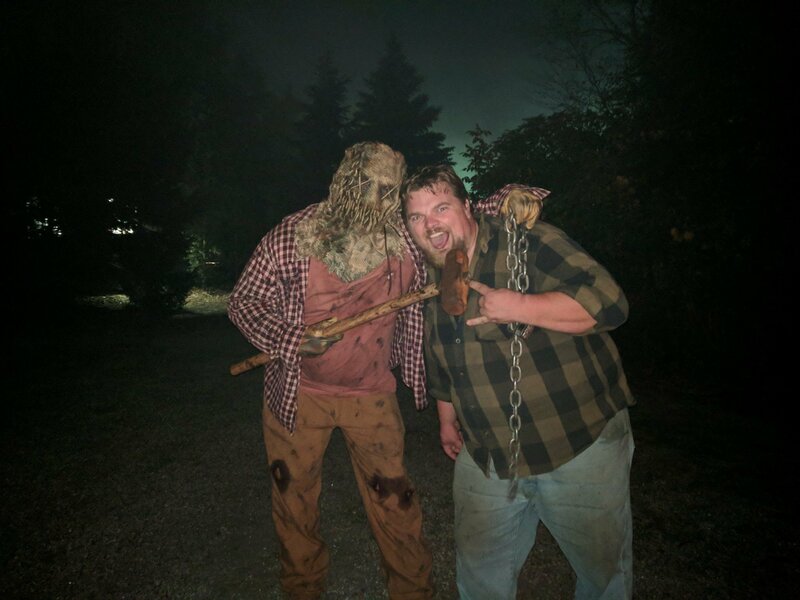 The Haunted Hayride: Like the free roaming actors of Legends of Fear, we found the types of characters on the hayride to be just as diverse. Even within their own scenes there were different ways of expressing the characters they had to be. A great example was a short but effective clown scene; we counted about six clowns in total but two of them were animated and talkative enough to get some great scares onboard the hayride, another two were more silent and attacked the passengers from the outside, the last two were these freaky girls who were doing some sort of ballerina dancing on a platform. Towards the end of the hayride we encountered about five or six witches. Again they all had their own little style of what type of witch they wanted to be. We’ve seen quite a few takes on the redneck/hillbilly persona and much to our dismay they usually fall flat. Mostly due to the weird inability to speak with a cartoonish southern accent. Much to our surprise the redneck dudes on the hayride seemed to enjoy speaking in the tone of their characters. On top of that, they were good at it. Probably my favorite character on the whole hayride was a young girl who was kidnapped by a crazy butcher. There were two girls actually and they were both very good but the one who tried to escape and came on board with us made me think twice if this was real or not. She rushed onto the wagon and cried for help like I’ve never seen before. It looked as though she was actually crying and a little crazy from the torture she was being put through. Sure enough eventually the butchers found her and dragged her back into her cage. As the wagon pulled away she made one final attempt to flee but her plans were thwarted by the butcher who was still on the wagon. 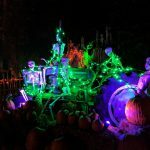 What might be the most memorable characters on the hayride AND the trail are the haunted nuns. Working off of the success of demon nuns from the second Conjuring movie we ended up surrounded by what I’m sure is going be the long lasting staple in the horror world. The beauty of the nuns is that they really don’t have to do much except stand there holding a candle, or a book, or in the shadows just enough so you can only make out their white faces. It’s a very different type of character but it works beautifully. My biggest complaint about the ride would only be the zombie attack at the end. The ride begins with a World War 2 air strike scene. By the time we come back to the same scene the victims of that air strike seem to have turned into zombies. But instead of your classic limping or growling type zombie these ones just ran from out of the woods with a war cry and tackled their enemy. Yet the enemy arose from the dead and seemed to act more like the type I expected. The Hallow: Naturally the actors would all be very different in this attraction because it is divided into four sections. What was originally just the Melon Head Trail has expanded to inquire the new Hemlock Manor Mortuary, The Pine Hills Parish, and the Dark Harvest. The Melon Head trail is without a doubt the most diverse. They have rednecks again looking to cut us up, a clown maze, a doll house, and a few crazy cat ladies. The cat lovers all seemed to be on the same page since they all had a problem with us walking through uninvited. The doll girls liked to yell a lot but they made their scene work and I understood that they take people and turn them into dolls. Although I would have liked to see more jittery doll like movement but the set made up for it tenfold. We really enjoyed the psycho clown leading us into the clown halls with his little dead puppet. We asked if the dead guy was OK and he replied “He’s OK in My Mind!” and started to laugh uncontrollably. When we made our way into the house of Hemlock Manor we were greeted in by the director of the mortuary. He explained to us how his funeral parlor is the cheapest in the area “while others charge an arm and a leg, we only charge one or the other” a good little laugh to let our guard down for a few seconds. We really liked the overworked but psychotic mortician. She had completely ripped apart a body into little bitty pieces and complaining to us that the body still isn’t ready. She was trying to fix a little marking on the face that somehow was still attached to the decapitated head. We return to the nun scene that we passed by on the hayride at one point. Inside the Pine Hills Parish we found an entire group of nuns praying. We didn’t know if any of them were going to come to life and jump at us. Like I said before though, they are creepy enough they didn’t have to. What was truly impressive was one of the nuns actually playing a Hammond Organ inside the parish. I had to stop and really look to prove to myself that this woman was actually playing the instrument. Just outside the parish was a flesh hungry grave digger character who was trying really hard to make me willingly let him bury me alive. I asked him why he would want to do that and he replied. 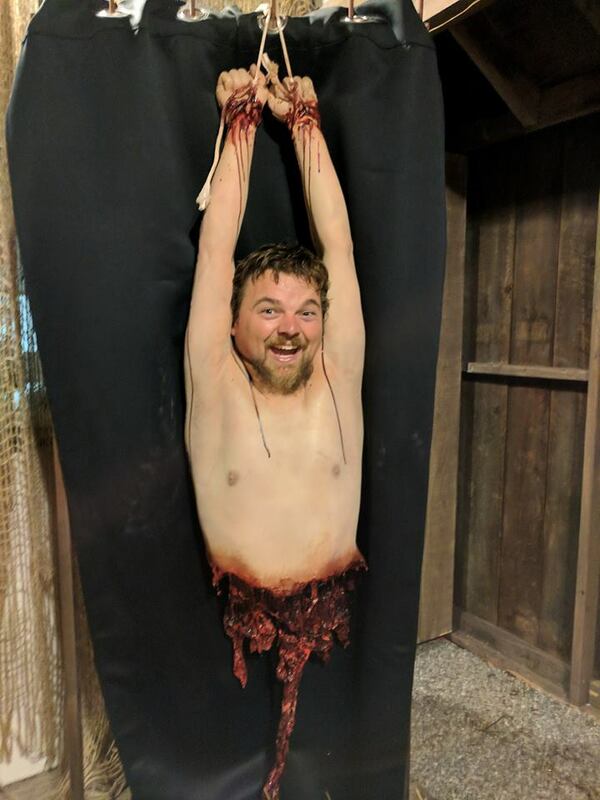 “So that I can eat your flesh.” I thought about it real quick and came to the conclusion that if you wanted to eat someone’s flesh then the last thing you would want to do is bury it but to each their own I guess. Now we began our trek back up the hill in the section they call the Dark Harvest. It was a little strange to us when we ran into a few goat looking creatures who didn’t seem to make much noise at all when we were approaching them or starting to walk away from them, then suddenly they started laughing and talking to us. We found a few more Witches at what they call Raven’s Rock. These were not like the colorful witches we found on the hayride. These were more dark coven magic type witches looking to pull things off of our bodies to make potions. Although they did say it was to make them fly on broomsticks which kind of wasn’t what I was hoping they would do. But at least they were very interactive and made us feel a little uncomfortable. 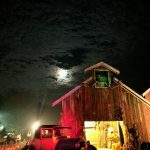 Before we were done with the trail we came across some more chainsaw swinging pig slicing brutes to chase us out of the last barn house of the night. The Hayride: There were a few choices of actors on the ride I would have changed a bit but nothing major. At one point during a chainsaw invasion of the wagon I was pretty distracted by some actors in baby masks and cartoonish corn masks. They seemed to be part of the redneck group so I was a little taken back by their choices to wear t-shirts and jeans with masks I could find at the drugstore. There is a sizable gap in between the last two scenes of the hayride so I can appreciate the effort to put something in the gap. Unfortunately that something was a random brigade of silent monsters and killers. It didn’t help that one of the coolest effects happened to be right there and everyone was focusing their attention on that instead of the costumes. My favorite costuming choice was with the Witches at the all new Witch cabin on the hayride. Every Witch was wearing something with it’s own color. I could have named all the Witches by the colors of their faces and dresses or vests. The clowns who danced on the platform were actually more or less in jester-style costumes which made their dancing more appropriate. The nuns have probably the second easiest costumes to find and yet it works perfectly. The Hallow: First costumes that really jumped out at us were the dolls. We loved how the dresses looked like authentic old century doll clothing. All of the actresses faces were painted like cracking porcelain. Everyone else on the trail was sporting appropriate fashion choices for their characters. Although they didn’t say much at all, there was a very dark section of the Dark Harvest where a few girls came out of the woods wearing these mystical looking Victorian era dresses. They also had these white pale faces like they were searching aimlessly for something. 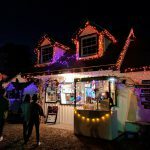 Fairview Tree Farm is easy enough to find at night given that it’s sort of off the beaten path but plenty of lights are on. The parking lot isn’t designed to easily accommodate the volume of people Legends of Fear attracts so sometimes you might have to park across the street in a big parking lot by the barn. Not that it is a long walk by any means at all, I only bring it up because chances are good their main parking lot is full if you arrive in the middle of the evening and your GPS is taking you directly to the entrance of Fairview. 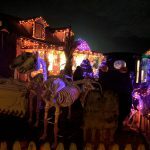 Because of the traffic, you will not be able to turn around and will have to exit the main parking lot on the other side of the property, which could really use some lights. So just as a warning you might want to be smart about parking and just park at the barn across the street from the farm. 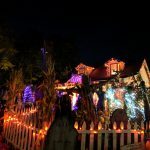 We were fortunate enough to get a front row spot that was taken up by a bin of mini Cinderella pumpkins but we were driving a little Scion so the parking guide let us squeeze in without any issues. There was plenty of help at the ticket booth with very easy to read signs for ticket prices. Within the same big shed as the ticket sales was a large food and beverage counter. 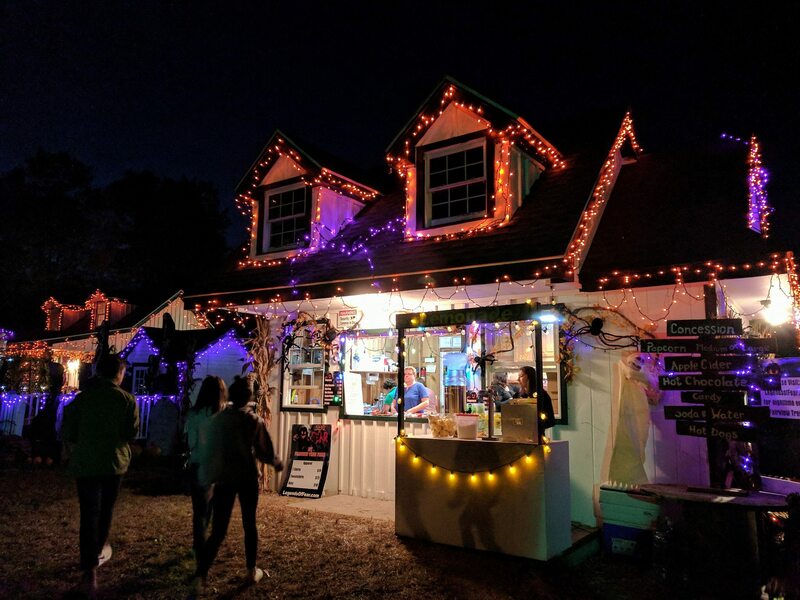 They had quite a few options for hot food and drinks, even fresh squeezed lemonade which is always good to have at a haunted attraction so you can tell people you just spilled a little if you piss your pants there. Fairview has a great little country store as well. 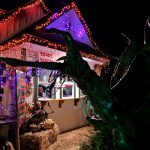 Inside the insanely decorated store you can find hoodies and shirts and hats to support this amazing haunt all year round. 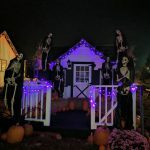 This year right on the other side of the store are a few great photo opportunities with a big haunted barn facade decked out with pumpkins, hay bales, skeletons and all kinds of Halloween spirit. We lucked out again because there was a full moon out and the clouds were being extra creepy that night so everything was perfect. I also can’t forget the goats! Brownie, Ernie, Misty, and Bonnie. 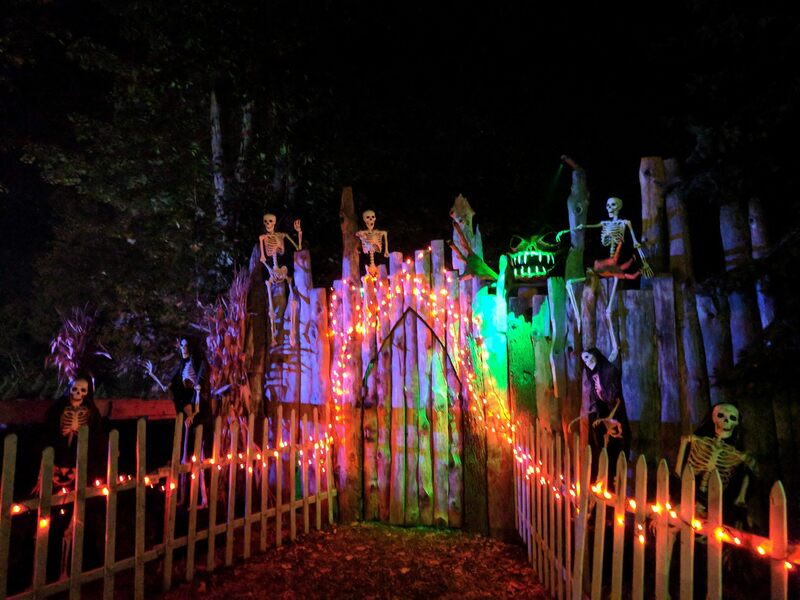 Another family-fun attraction to help make it a perfect October evening. The hayride was much more comfortable than most wagons I have been on. They were the big cages that actually moved giant mounds of straw instead of just flat bed platforms. So we sat on bales of hay with our backs leaning against the metal rig, which doesn’t sound all that appealing on paper but it’s better than nothing. The actors liked to take advantage of the rig and climb all over the thing so they can get at you from above. Some of them seemed to think that shaking the whole side of it might scare some of us but all it did was push us around and made it uncomfortable. The ride was actually very smooth other than that and I’ve come to expect a few dips in the road here and there but I was pleasantly surprised. The trail was much longer than I thought it would be and it was entertaining from start to finish. Just know that before you finish there is a slight incline walk for a little while. But every spot on the trail was smooth and soft, no rocks or branches to trip over so long as you stay the path. They set up a projected screen at the beginning of the trail that plays some music videos and horror movie clips while we waited in line. We were only in line for a few minutes but we were lucky enough to catch a showing of the old 1995 Halloween Dunkin Donuts commercial with the little Dracula, Frankenstein, and Werewolf faces on them. That brought me back. The hayride took us mostly on the outskirts of the tree farm so there wasn’t too much happening on the farm side of the wagon. But when we entered the forest all bets were off. The fact that the moon was a bright orange that night made the light through the trees look incredible. Later on when we entered the trail I was taken away by how cool it was when you look down into the woods. The only sources of light were all the different colors of the multiple scenes. Plus all the fog expanded the light and we could just stand there and watch the colors change and flicker and listen to the screams all night. The set they made for the new witch scene on the hayride is beautiful. Made out of great looking lumber yard scraps and symbols made out of birch branches and oil lamps hanging, it’s just a really nice looking set they worked very hard on. The doll room was the most impressive room we walked into during the day in 2016 and we were eagerly anticipating when we would be able to walk into it again. Just as we remembered and more with a whole weird variety of old beat up dolls hanging all over the place and mirrors too that make it seem like there are twice as many dolls in there. I’d never thought I would be writing this but cats are an overlooked commodity in the haunted house scene. At most I can think of one place that put a creepy looking cat somewhere in their scene. Legends of Fear has a whole section dedicated to cats and it’s really freaky. 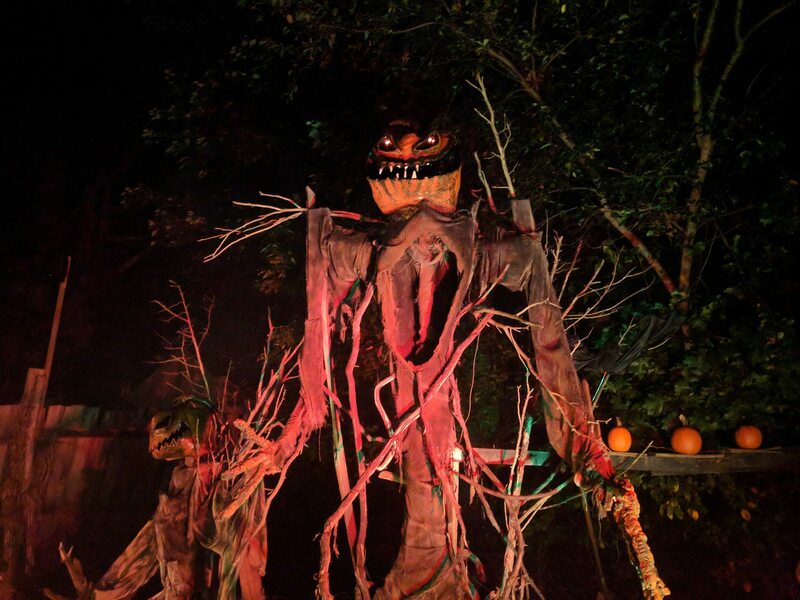 Chainsaw boys and girls aren’t anything new but the weird clubhouse style maze they made for their section paired with loud heavy metal music was different and exciting. We can’t say enough great things about the new Hemlock Manor. Even when we stood at the top of the trail we couldn’t see the grand facade in all of it’s glory because they hid it behind a ridge in the woods. The real beauty is that we weren’t expect to see anything like it in the woods. Once we made it past the heavy metal chainsaw melon head boys we found ourselves standing pretty much right in front of this old beautiful manor with a cool lightning effect flashing all over it. A great staple of the creepiness that is Legends of Fear is the fact that you will be in the presence of many, MANY real caskets. 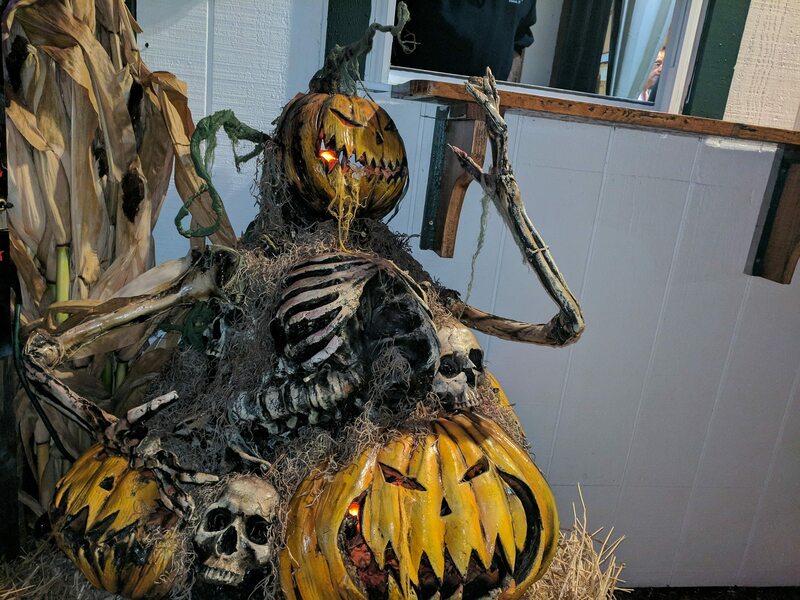 These have been in the haunted trail for a long time and it only made sense to give them a better home in a mortuary house. I would say you need to try real hard to not see the most memorable effect of the evening. During the airstrike scene we came into close quarters with a giant ball of fire. This fire can be seen pretty much anywhere in the parking lot and even from the main road. 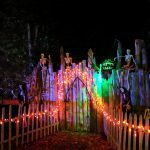 We enjoyed the over use of fog at Legends of Fear because they use it for much more than just some spooky mist setting. 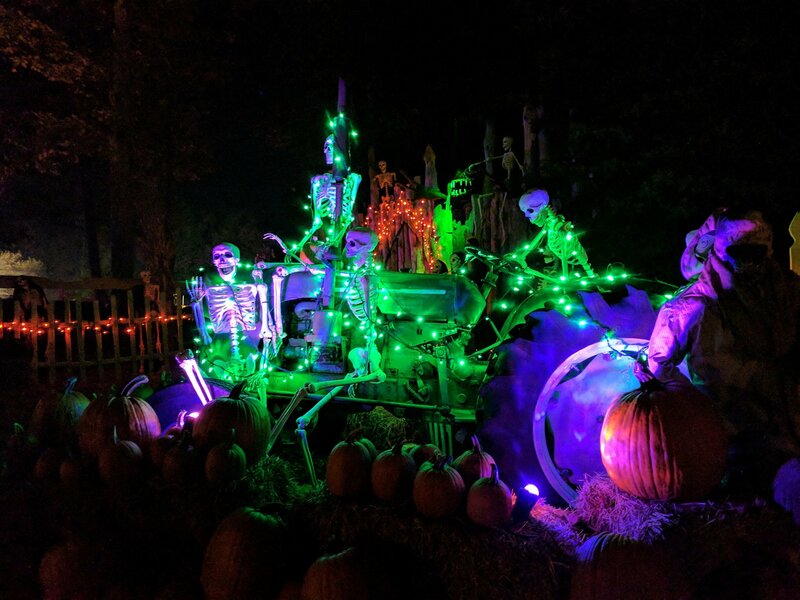 They had these powerful lasers beaming from the clown hut on the hayride and because of the fog we could see them shooting a good 250 feet across the tree fields. Speaking of the clowns, along with the six clowns that we spotted in the scene, the animatronic is the thing that stole almost all the attention. The heavy guitar clown music gets louder as we approached and suddenly out of a box bursts this crazy shaking clown. Adding to the already diverse line up of evil clowns. 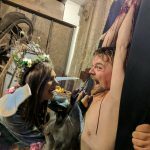 What might be the second most memorable effect of the night is something most haunt goers have seen at least once or twice but not on this scale. A colossal laser vortex tunnel made to fit the whole wagon. I had to just take in the beauty of the green foggy tunnel we were in. In the trail we first came across a nice bloody cyclops head on a pike. Not far from the head they had an injured deer wrapped in barbed wire and covered in maggots. 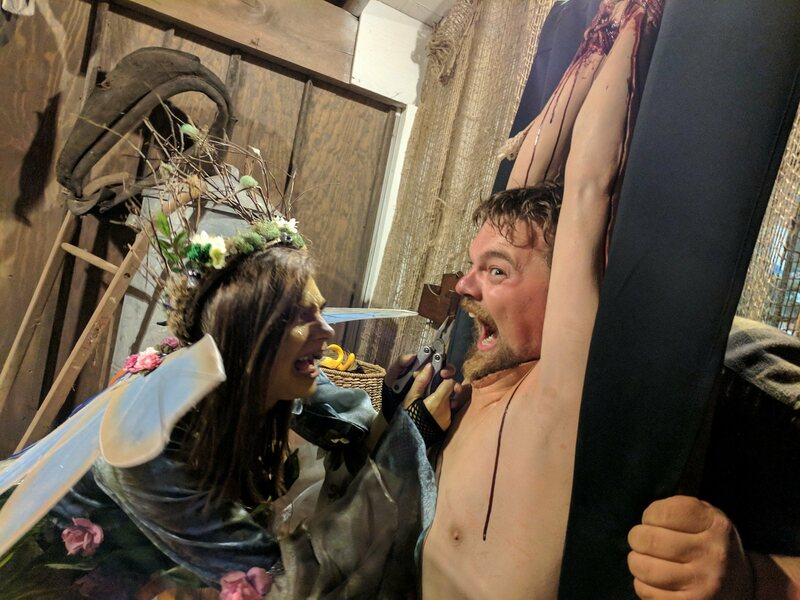 These weren’t exactly the things I would choose to get us into the haunt mood but it would be a little while before we came across anything else so at least it is something. I’ve always been a sucker for those old cathedral bells. The Pine Hills Parish plays them on loop and every time there is a little bit of a gap in between scenes we could hear those bells getting closer and closer. Before then we had to brave the Hemlock Manor with its mysterious self moving rocking chair out on the front porch. Inside we were treated to a great use of the Bloody Mary mirror. The morticians room was playing some very old time music that just made everything so much more creepy. 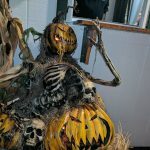 Yet again we have another haunted attraction that doesn’t seem to follow an overall theme throughout its individual haunts. 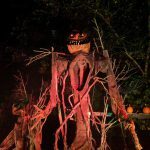 However they do play with the theme of a local urban legend I’ve been referring to as “The Melon Heads.” Fairview Tree Farm is in a prime spot of this legend that tells of some escaped mental patients living off of the woods and cannibalism and inbreeding. They are called melon heads because of the large shape of their head from physical disfiguration due to inbreeding. We didn’t see anyone with a big head though, just a bunch of crazy killing rednecks calling themselves the melon head boys. For the most part the themes are sporadic but consistent within the individual attractions. My favorite effect came in the form of a perfect distraction. 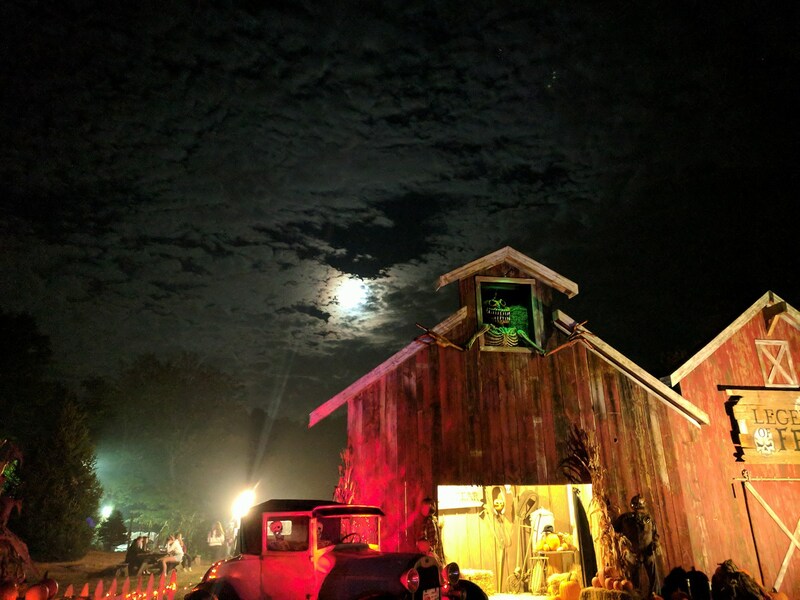 *Spoiler Alert* At one point in the hayride we were driving up to a little actor in a simple werewolf costume crouching on the ground waiting to attack. 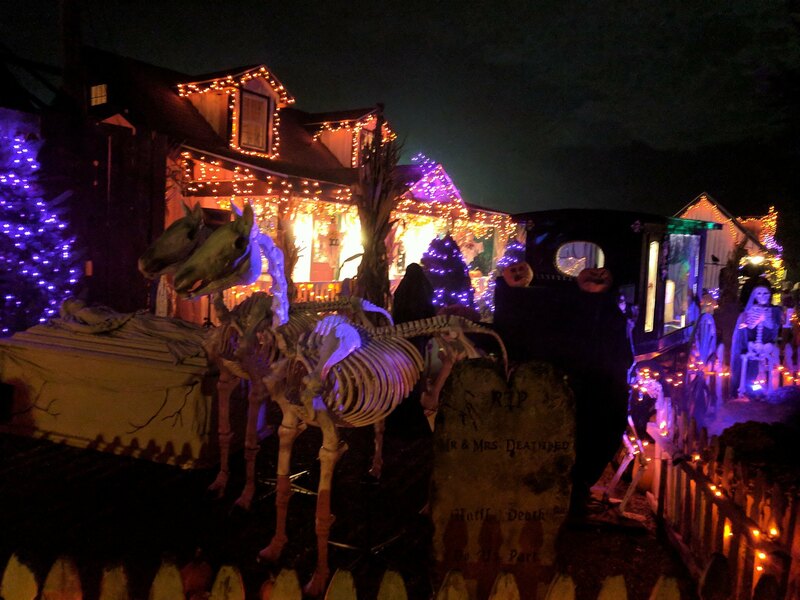 Funny thing was that he was about ten feet away from the wagon in a little area lit by some tiki torches, so it wasn’t really a well thought out scare. He did his thing and barely scared anyone but because there was nothing else to look at we just sat back and waited for a sign of the next scene. Our guard was completely let down and a giant werewolf head came out of nowhere right behind me with loud growls and red glowing eyes, it was intense. I did discover on this night that cats can actually play a much bigger role in haunted houses than they currently are. The first real scene we walked through on the trail was loaded with cat cages, cat toys and even hanging lines of fur that I could only assume was dead cat fur. The ladies complaining that we entered without being invited all looked like crazy cat ladies. Once the sounds started pouring in of mean growling and hissing cats all I could think about was getting my face clawed off by some clawed spawn of Satan. This was a very unique setting to me and it actually did make me feel very vulnerable. Legends of Fear really did a fantastic job by knowing when and where to bring their big guns. Fear cannot just keep getting bigger and better, everyone has a breaking point and everyone’s is different. With the family setting they project at the ticket booth most people should go into this attraction thinking it’s not as bad as they thought. Many scenes on the hayride go from extreme to less extreme to moderate and right back up to extreme. The same goes for on the trail, it does not keep getting more and more intense, it fluctuates and gives everyone a chance to breath. This is how you keep fear going for over half an hour. 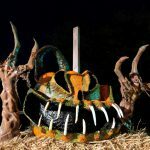 Tickets for the hayride cost $25 while tickets for the trail cost $24. Combo tickets for both attractions will set you back $42 and Fast Passes go up to $57. 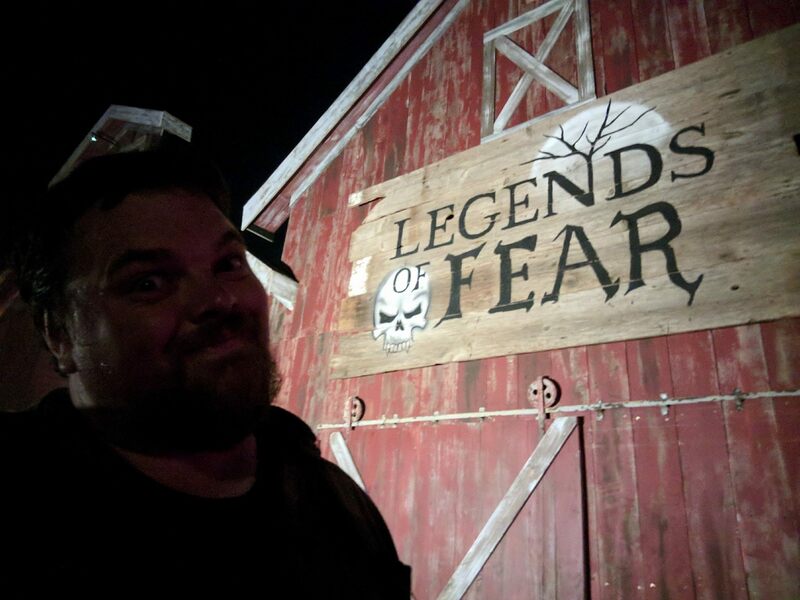 In total we spent a good hour and seven minutes inside the attractions at Legends of Fear. This gives us a total minutes per dollar value of 1.6. For every dollar you spend on a combo ticket you will roughly get a little over a minute and a half of excellent haunt action. This venue is a perfect place to celebrate the season we know and love. With the way they decorate their gift shop and photo opportunity areas anyone of any age would find this place very entertaining for a great price. The hayride is one of the best we have ever been on and the trail is probably the longest and most involved trail I have ever gone through. 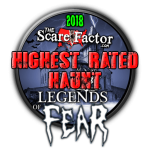 If you are looking for a near perfect way to have a great October evening you need to look no further than Legends of Fear!